Ever have a couple of really good days? Or on the other hand, ever have something really good happen, that makes your whole day seem great? I spent yesterday running around doing errands, and came home feeling exhausted and wondering why people need to be so snarky and mean to each other. Then I took in the mail, and realized that for the most part, people are sweet and good and thoughtful, and there are just a few who are duds. 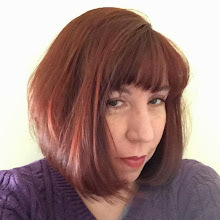 The sweet, good, thoughtful person who made my day yesterday was my friend Ragan, who not only knits very well, but is a crafter extraordinaire!!!! Just look at what she sent me!!!!! 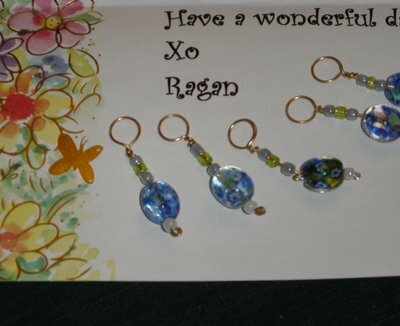 Handmade pansy stitch markers and a lovely note!!! Seems she signed up for a stitch marker swap, and when she saw I wasn't on the list, she decided to send me some anyway so I wouldn't miss out on the fun. Isn't that sweet? And how ever did she know to send me the pansy ones? When I was little, my grandfather was a florist, and I would spend hours sitting in front of the shop looking at the pansies. And now that I have my own house, I plant pansies up the front walk every spring. It's like she somehow knew!!! Thank you Ragan, you really made my Monday!! Go on over and give her a big MWAH, okay? First thing this morning, the second good thing happened. I finished up my Ocean Socks!! I had a lot of fun knitting these socks. They did get put aside during the Olympics, but I was so glad to get back to them because the pattern is so much better. I love the Trekking yarn, it lived up to every good thing I've heard about it. I am officially addicted to sock knitting now. 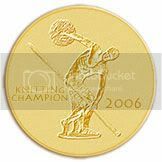 I've already cast on for my next pair with the same yarn I made the Olympic socks out of. That pair went to my best friend, so now I'll have a pair to match. Maybe I'll call them my Bestus Buddy socks . . . just to go back to that junior high mentality!! I'd show you my progress on them, but the camera batteries died after the Ocean Sock picture. I'm doing them on two circs and using this pattern so I can give short row heels a try. I'm so anxious to learn something new with each pair of socks I knit. I wonder what I'll try after the Bestus Buddy Socks are done. Any suggestions? What's your favorite sock technique or pattern? Nice socks! I'm too much of a first sock syndromer, that it's even hard for me to envision casting on and completing a second one! I am glad that the stitch markers made your day, and I LOVE those socks! They are terrific! Conwy from Knitting On The Road! Made them twice myself. Yay! 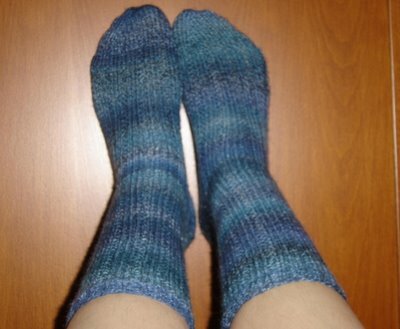 Finished socks! And the stitch markers are lovely. Love that Ragan! I love Charlene Schurch's sock knitting book. There are tons of great patterns in there and you can mix and match most of them. What a wonderful friend you have to send you such gorgeous stitch markers and your socks came out fantastic! I am so happy that you have joined the sock brigade! They really are too much fun! i dig your socks' colorway. very pretty shades of blue! your friend made some great stitch markers- did she make the beads too or did she buy them? i love the little flowers- it would be cool to make a little bracelet out of similar beads. Love the socks! The colour is gorgeous! And the stitch markers are gorgeous too! Little knittery related surprises in the mail are great arent they? Your socks are so pretty! I love the way the colors change. And such pretty stitch markers. I love pansies too and those tiny ones inside the beads are so cute. My favorite socks that I've knitted are the Whitbys from Knitting on the Road. Really enjoyed the pattern and love wearing them. Way to go Ragan! Beautiful Ocean socks are fantastic they look so comfortable! Nice socks - cute stitch markers, too! So you made your Thujas using regular sock yarn, not worsted? On size 3's! Thank you so much for that...It has been hard to find worsted to do these! You made my day as I like the pattern a lot! The sock pattern I have used the most is one I bought at my LYS - it FiberTrends Hellen's Favorite Socks. There are 6 variations (lace, mock cable, regular ribbing) and I have used it 3 times. I am sure I will use it many more times!